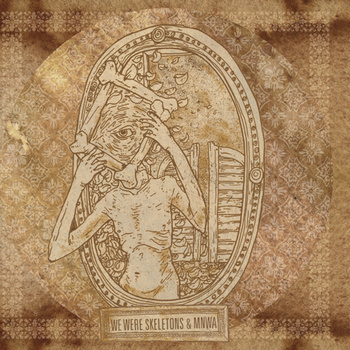 One Path For Me: We Were Skeletons / MNWA - split 7"
We Were Skeletons / MNWA - split 7"
We Were Skeletons sounds a bit more aggressive on this one than I've previously thought. There first track "Wolves" belts out in 53 seconds and gives you a non stop raging of screaming and powerful chords. They return to their more familiar ground with the 4 minute noodly and melodic compisition of "The Ghost of Jean Glam". The song carries more of the dynamics you've come to know from this band, taking things from waltzy and open to a more concentrated technical barrage. Of particular note here is the epic ending which crawls and screams with feedback as the slow drums bring us to a close. MNWA remind me of a lot of the screamier bands I was hearing in the early 2000s. The recording is a bit harsh, and although I tried my best, I don't seem to hear any bass or low end present. Perhaps they are just comprised of drums and guitar. There are dual screams here that take you way over the top with some throaty and vivid growls. Musically you get some feedback laden guitar keeping things on the dicordant side while busy drums hold up the backbone.